International applications to European business schools are riding high. According to the Graduate Management Admissions Council (GMAC), the majority of programs in Europe saw an increase in international applications in 2017. Evidently, more international students are looking to European schools to further their business knowledge and their network. The multi-campus EU Business School (EU) is delivering both. EU has campuses in Barcelona, Geneva, Montreux, and Munich, and a thoroughly global outlook—37% of EU Business School students take up the opportunity to study abroad during their degree. EU’s industry connections help students make their own connections too. In March each year, EU Business School students travel to Basel, Switzerland, for the Baselworld Watch and Jewelry Show, which boasts over 2000 exhibitors from more than 45 countries. For Fanny Skoglund, an undergraduate student of International Relations at EU Business School’s Barcelona campus who visited Baselworld last year, the brand event was an opportunity to network with leading industry figures. Originally from Sweden, Fanny hopes to start her own business after graduation. She aims to utilize the connections she made at Baselworld to help her get started. “Baselworld is a great place for networking and exchanging information,” she says. “I’m still in contact with some of the people I met there [last year], which will be a great asset. Fernando Licona Lases is a Mexican part-time MBA student at EU Business School’s Munich campus who ran his own advertising business for six years prior to his MBA. He points to the introductions the school made with luxury brands like Blancpain, Breguet, and Tissot at Baselworld, as well as a talk students were given by Jean-Claude Biver—the CEO of luxury goods company Hublot. The benefits of EU Business School’s network extend beyond the confines of the Baselworld exhibition center. Through connections forged by the school’s careers department, Fernando was selected to participate in a sustainability project for Stadtwerker München (SWM), a public services organization in Munich, Germany. As for Fanny, she’s secured a summer internship in the cosmetics industry in Dubai. 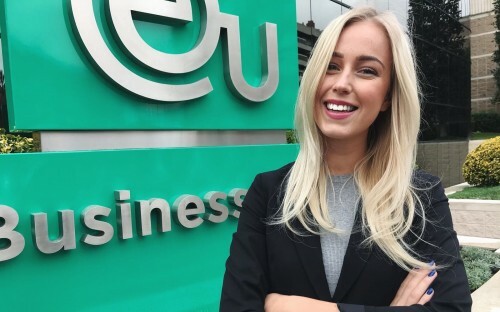 She believes that the international connections she’s made at EU Business School not only helped her land the internship, but will help her make the most of it too. “We very often have networking events with different companies to help us make connections,” she explains. “It’s things like this that make you grow as an individual—both professionally and personally. Fernando agrees. He believes that networking opportunities like those EU Business School creates for its students are essential—especially for international students like himself.